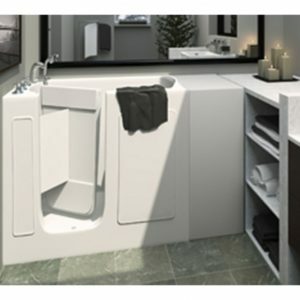 You want the best quality walk in tub with door you can find without spending too much money. We want that for you as well! Our walk in baths come standard with lifetime door seal warranties, but also are extremely affordable! We carry several of the top leading brands that you can count on at low everyday prices. Find several different styles of walk in bathtubs and tubs with a door. 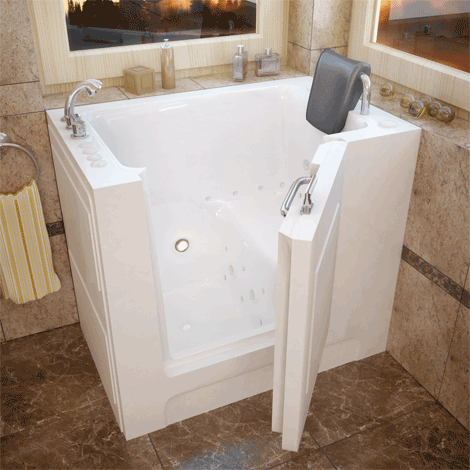 The 2739 series is a reinforced fiberglass acrylic walk in bathtub with a right side door. It’s perfect for installations in small areas such as a shower stall, mobile home, closet or even a laundry room. Enclosed on three sides, the free standing design let’s you enjoy the joy of independent bathing anywhere you choose! We have several in-ward swinging door models, but also carry a wide variety of outward swinging door walk in bath models. It is simply a matter of preference. In some installation situations the bathroom may not have a lot of extra space, so choosing a smaller walk in tub with an inward swinging door may make more sense. Transversely, when there’s extra room, an outward swinging door walk in bath might be the better fit. Bathtubs that can be used in conjunction with a hydraulic lift have a large outward swinging door so the bather can sit right down onto the bathtubs seat from the exterior of the tub. Transfer boards can also be used to help facilitate someone entering the transfer tub. These types of bathtubs will typically be installed in bathrooms that are large enough to accommodate someone in a wheelchair. This modern looking front entry outward swinging door 27” x 39” walk in bathtub isn’t only stylish, but it’s also very functional. It can be equipped with full air and water hydrotherapy jetting, temperature control, aromatherapy and even colored mood lighting. Manufactured in Florida by Spaworld. Meditubs are a premium brand of walk in baths that come with industry leading warranties and quality standards. 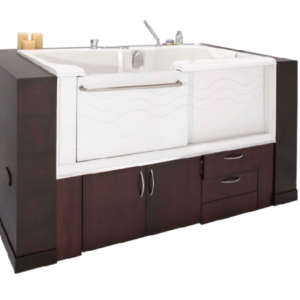 They are one of North America’s largest manufacturers of walk in bath tubs with hydrotherapy. If you are looking for a quality, low cost option, this handicap bathtub may be the right fit for you. Please contact an Aging Safely Senior Bath Representative today to get pricing and additional information.